What’s 65 feet tall, offers energy efficient heating and is home to a 16-foot-tall robot? 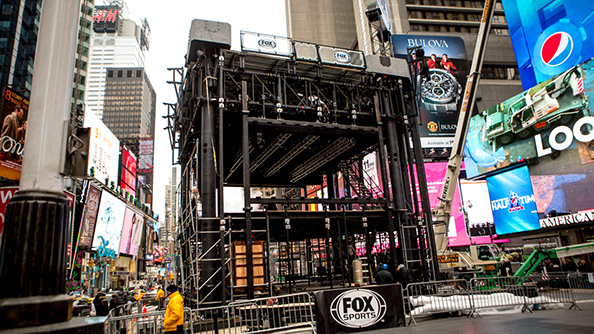 The Fox Sports Times Square Super Bowl studio. 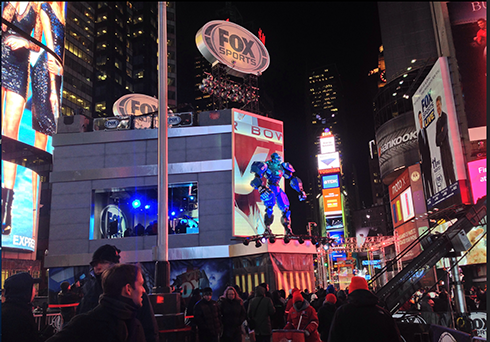 The studio, which, according to the Times Square Alliance, is the largest non-permanent structure ever built in the bustling outdoor space, will serve as home base for Fox Sports’ broadcast team during its coverage of Super Bowl XLVIII this Sunday. The structure, which occupies a 40 by 40 foot footprint and rises 65 feet in the air, offers 8,100 square foot of usable production space that’s completely climate controlled, according to Jeff Hall of JHD Group, the firm that designed and oversaw the construction and installation of the studio in conjunction with PRG. Onsite work began Friday, Jan. 17, overseen by 15 site supervisors and five project managers. Over 60 people worked to build the structure in sometimes extreme conditions — including a snowstorm that dumped a foot of snow on the area. All told, 27 semi truck delivered delivered the necessary parts to Times Square.